Late last week, the newly elected Ontario Progressive Conservative government announced that they would be imposing a new electoral map on the City of Toronto, a decision that would eliminate the new 47 wards approved by Toronto City Council, replacing them with the same 25 boundaries used by the federal and provincial governments. It’s very clear that Premier Doug Ford’s plan, which requires a new piece of legislation, ironically titled the “Better Local Government Act,” is vindictive and mean-spirited because it only affects the City of Toronto, which rejected Doug Ford’s 2014 mayoral bid. It quashes the hopes of many young, racialized, and progressive candidates looking to change the make up of a council that has generally supported Mayor John Tory’s agenda. It is unfair to candidates that ran in good faith, started campaigns, raised funds, and spent money hiring staff, purchasing materials, and renting campaign offices. But most of all, Ford’s actions are an attack on local democracy because of the haste with which they are being made, at the end of the nomination period for those approved 47 wards. They ignore the years of study by independent experts and several rounds of public consultations. They also benefit Toronto’s suburban areas, which are growing at a far slower rate than downtown Toronto, North York Centre and Etobicoke’s waterfront area, which will be disproportionately affected by this arbitrary decision. Each new ward was designed to have an average population of 61,000, with a population range of between 51,800 and 72,000 (+/- 15%). They were designed to last for four election cycles, to be re-drawn before the 2034 election. It is worth noting that the independent experts looked at using the 25 federal/provincial boundaries twice. In the first study, they were rejected early on because they would not “meet the tests of effective representation.” The federal boundaries, which are also adopted by the province of Ontario, are based on population counts from the 2011 Census, and are already seven years out-of-date, while the consultants were tasked with developing new ward boundaries to last 16 years. Even a 50-ward solution (which mimics the old 44 wards based on the 22 federal ridings that were established in 1996 and came into effect with the 1997 federal election) would result in severe variations in population. After Tory’s Executive Committee tasked the Toronto Ward Boundary Review team to re-examine options that would see fewer than 47 councillors elected in 2018, they re-examined using the 25 ward boundaries. 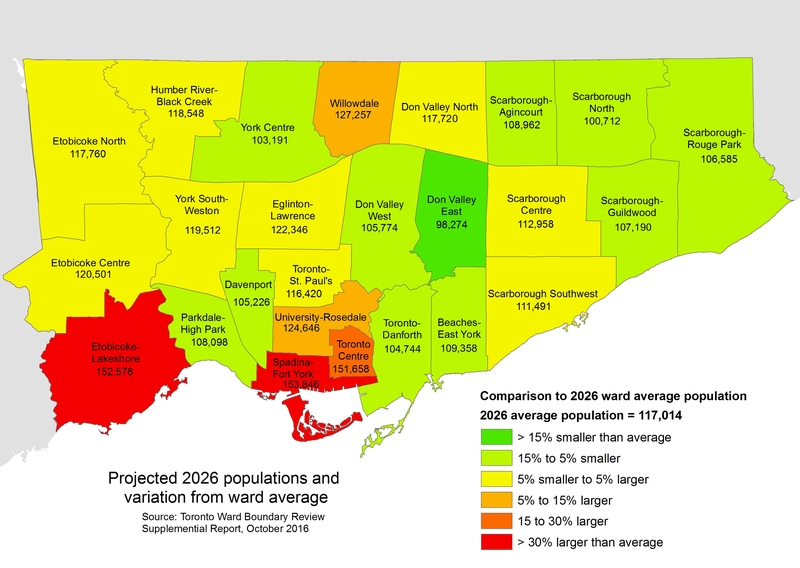 They found that in 2026, three of those wards — Toronto Centre, Etobicoke-Lakeshore, and Spadina-Fort York — would have populations over 30% higher than the ward average in 2026. Willowdale and University-Rosedale would also have had much larger populations than the city average. The review team also looked at a 26-ward option that mostly maintained the riding boundaries but added a new ward downtown out of the Toronto Centre and Spadina-Fort York constituencies and adjusted boundaries in southern Etobicoke. Even then, Etobicoke Centre and Etobicoke-Lakeshore would still have populations over 20% higher than the city-wide average. Despite making some adjustments for population growth, this option would have not have corresponded with some ridings, and was also not recommended. For those reasons, and to support local representation, the 47-ward solution was once again recommended, and was approved by City Council in November 2016. Councillors Justin Di Ciano (Ward 5) and Giorgio Mammoliti (Ward 7) then appealed the new boundaries to the Ontario Municipal Board, but they were dismissed. The 47-ward solution has survived despite it all. Mayor Tory may have brought back decorum to the mayor’s office after an embarrassing period under Doug Ford’s brother Rob, but he has pushed an austerity agenda, and has failed to show leadership on police reform, wasteful infrastructure spending, and safe streets for pedestrians and cyclists. His initial reaction, to call for a referendum on Ford’s plan to cut Toronto’s council, was a characteristically weak response; he was later pushed into supporting a legal challenge by an angry public. Meanwhile, some of Tory’s allies, like Di Ciano, David Shiner, and Glenn De Baeremaeker, support Ford’s actions. Ford’s attack on local democracy is an insult to candidates who have already put their names forward for election and launched their campaigns. It undermines the City of Toronto’s legislated responsibility to decide its own ward boundaries. And it will only exasperate existing disparities in council representation. This entry was posted in Election, Maps, Politics, Toronto and tagged 2018 Election, City Hall, Doug Ford, John Tory, Map, Maps, Queen's Park, Toronto, Wards. Bookmark the permalink. Good summary, but your 26-Ward map should use the reverse color range. The main issue is voter parity; the larger the ward population, the higher the unfair voter disadvantage. Since we perceive red to mean “bad”, shouldn’t the disadvantaged wards be the ones coloured red? They are. I used the same colour scheme as the 25 ward map. 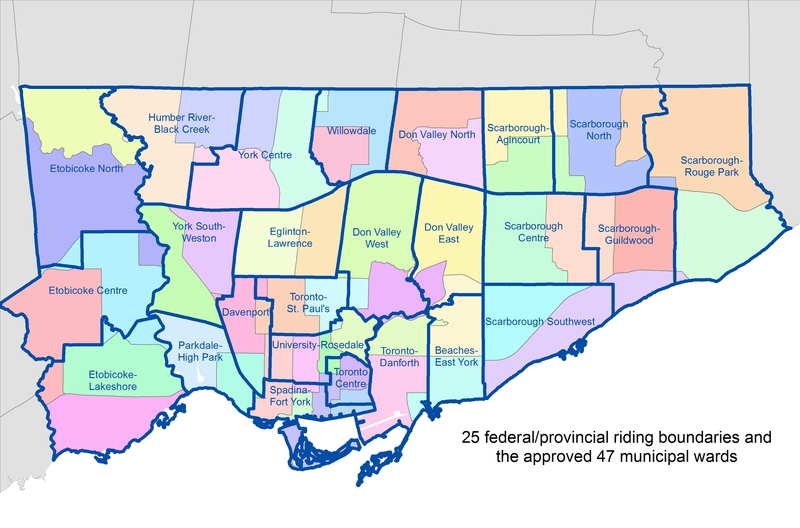 Had the 26 ward boundaries been adopted, Etobicoke Centre and Etobicoke Lakeshore would have had the largest populations compared to the ward average, but they would not be as bad as inequities in the 25 ward scheme Ford and the PCs want to impose on Toronto. I reside in the Spadina Fort York riding and welcome the changes. I’ve watched Mayors and Councils come and go dating back to David Miller. In that time I’ve seen transit plans proposed and mothballed countless times, City Infrastructure neglected and projects like the Fort York pedestrian bridge wallow in a state of perpetual construction. City Council needs a wake-up call and if nothing else this is a turn in a different direction. The sky is not falling. Actually transit was soundly planned during Millers tenure. It was yet another Ford that ruined that and was too dumb to understand LRT vs Streetcar. Even set things back in wards that supported him.